Efteling is a theme park and leisure complex in Kaatsheuvel, North Brabant, The Netherlands. It’s themed around fairy tales, myths, legends, fables and folklore. It’s one of the oldest amusement parks in operation in the world and one of the largest in Europe. Originally Efteling catered towards children with a fairy tale theme, nowadays Efteling appeals to young and old with its cultural, romantic and nostalgic theme and its variety of amusement rides. In over sixty years, Efteling has evolved from a general nature park with playground and unique Fairy Tale Forest, into a full-size industry-leading theme park. Efteling is famous for its great attention to detail, the green atmosphere and excellent dark rides. With over four million visitors annually, it’s in the top of European theme parks attendance. The base for the park as it is now was created in 1950. Artist Anton Pieck and inventor Peter Reijnders set out to create a quality fairy tale forest. Pieck’s remarkable, nostalgic style combined with Reijnders’ ingenuity and the use of “real” materials created an enchanting forest that immediately profiled Efteling as a national attraction upon its opening in 1952. The style set by Pieck has been the base for many developments after that, setting the park apart. The months between April and September are high-season. In this period as many rides as possible will be up and running, there’s more entertainment and more restaurants are open but you won’t be alone. The peak-season for attendance are weeks 51 – 1, 8-9, 18, 28-35 and 42-44. That’s when the Dutch kids are on school break and families flock en masse to the Efteling. As for the other periods consider the months between November and February to be off-season (with the exception of the holidays). During this period fewer rides are running, there’s little to no entertainment and some restaurants are closed but it can be (serenely) quiet. In recent years March and especially October can also rival the high-season, even though the Efteling oddly still considers this off-season. During both the Negen Pleinen Festijn and the Winter Efteling the park adds extra entertainment and theming to create a sizzling summer or warm winter vibe. Slight variable is the weather. 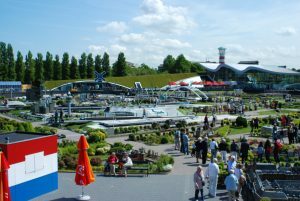 Temperatures between 15°C-25°C with dry, sunny weather are considered prime theme park weather in The Netherlands. As such poor or good weather can have a substantial impact on the number of visitors. Even in quieter months nice weather will increase attendance. And during high season tropical temperatures will result in a deserted Efteling (because every Dutchman is on the beach).